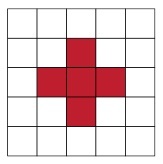 Red Heart offers this pattern to honor the Red Cross and their tremendous efforts to alleviate human suffering throughout North America. Visit www.redheart.com/redcross to learn more. 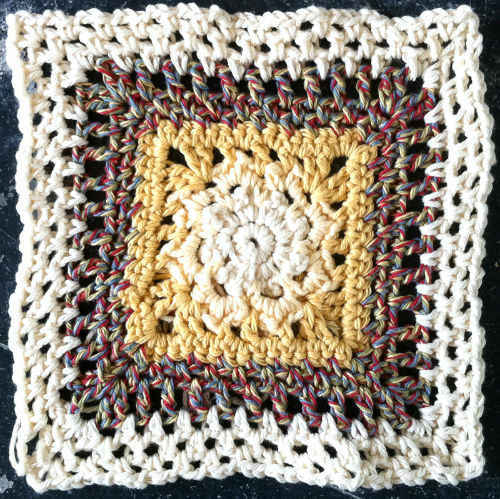 Gauge/Tension: GAUGE: 20 sts = 7 inches (18 cm); 22 rows= 7 inches (18 cm); in single crochet. CHECK YOUR GAUGE. Use any size hook to obtain the gauge. To shape finished pillow, pillow forms are larger than finished pillow cover. Row 1: Sc in 2nd ch from hook and each ch across, turn—9 sc. Rows 2-10: Ch 1, sc in each sc. Using whipstitch and following diagram, sew 25 squares With wrong sides together, A, and using whipstitch, seam pillow together along 3 sides. Weave in ends. Insert pillow form; sew remaining side. * = repeat whatever follows the * or ** as indicated.